Patient before surgery with Dr. Williams. This patient just entered his 40s and decided he wanted a “new hairline” for this new decade of his life. He lived with a recessed hairline for too long and was finally ready to do something about it. He did his research and decided Dr. Joseph Williams was the right doctor for the job. 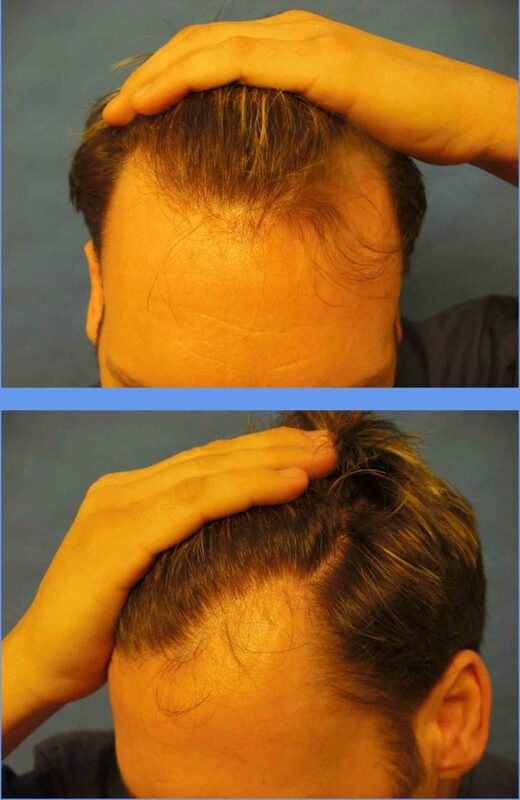 Using only 1,105 grafts, Dr. Williams recreated his entire hairline and frontal region. Dr. Williams carefully created the incisions using custom blades between 0.8mm and 1.1mm in size; 500 single hair grafts were used to recreate a soft and natural hairline, and 605 2 and 3 hair grafts were used behind it to build density. The patient returned to the clinic 12 months later, happy to show off his new hairline; a hairline which felt right for this new decade of his life. Left: before surgery. Right: 12 months after surgery. To see more examples of Dr. Williams work, see his HTW profile.